We were visiting St Margaret’s Bay for a family event, and decided to make a weekend of it (staying at the very reasonably priced Park Resorts – the platinum caravans were excellent). 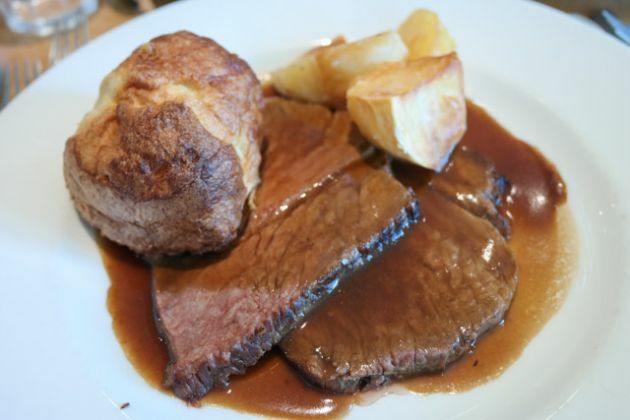 This meant we had the opportunity to review a Sunday lunch in Dover. I chose The White Cliffs, about 10 minutes walk from where we were staying, on the recommendation of my uncle. It was easy to book a table, I actually called a week before (I was feeling very organised) and reserved for 12:30 (the earliest time). 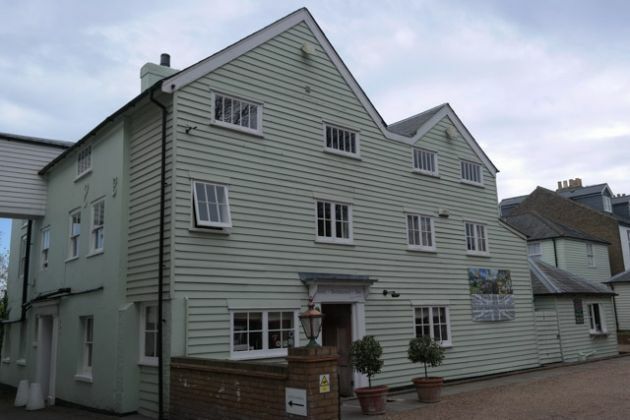 Situated slightly back from the main road, with a small car park in front, it was an old building. Through the doors and down a couple of steps, we were met at the bar/little hotel reception area and shown to our table in the bright restaurant. A high chair, which needed a bit of a clean, had already been set up for us. The tables were laid out for the diners, with linen napkins (one of the touches I like). There were very nice photos and paintings of various white cliffs of Dover images around the restaurant, some of which were available to buy. It was a bit wet outside, but there was a large garden which would be good in better weather. All in all, a very relaxing venue and I was looking forward to lunch! I saw a white beer on tap, but when I asked they said it was not available… BUT they did have Erdinger in a bottle. Now, white beer / lager is a favourite of mine, especially Erdinger :-) Claire ordered a glass of Kentish (!) sparkling wine. So, for drinks, they score 5 out of 5! A 3 course meal with a 15 month old is a bit of a stretch, so we decided to forgo starters this time. 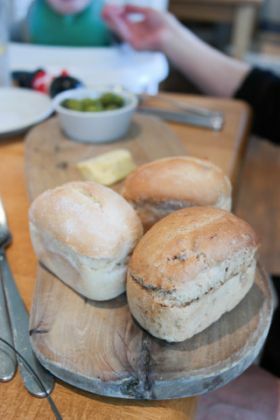 Instead, we were brought some wonderful, just baked, mini loaves of bread with hand made butter! 3 for us, I really enjoyed them. I ordered the roast beef, Claire also asked for roast beef (well done) and JW the children’s roast chicken. It came out quite swiftly. I had two thick slices of beef, 4 roast potatoes. 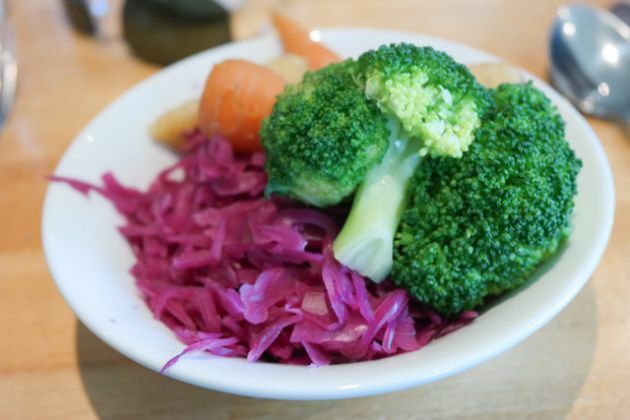 We had bowls of veg also brought out – broccoli, carrots, red cabbage and (wait for it…) cauliflower cheese! 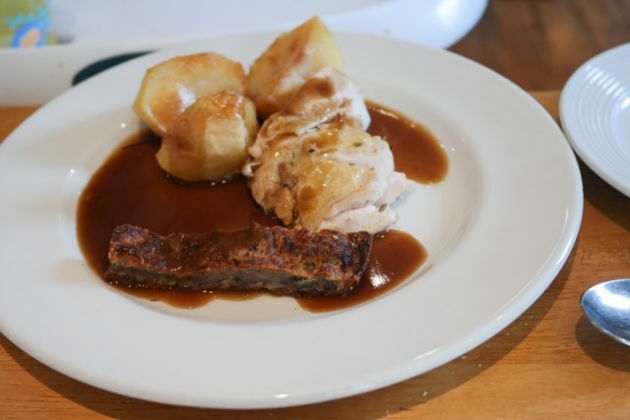 The children’s roast consisted of a sliced chicken breast, 3 roast potatoes, a strip of stuffing and gravy. The roast beef was wonderful with a lovely seasoning on the outside. The roast potatoes were excellent, a nice size and crispy. The cabbage tasted fresh, along with al dente broccoli and great carrots. Yorkshire was very good, nice texture inside and tasted fresh. 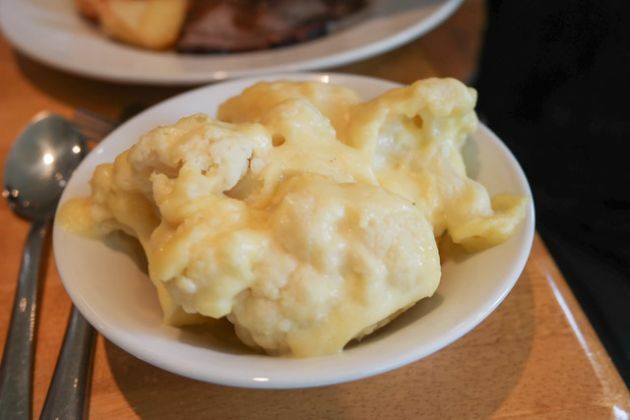 The cauliflower cheese was cooked perfectly. 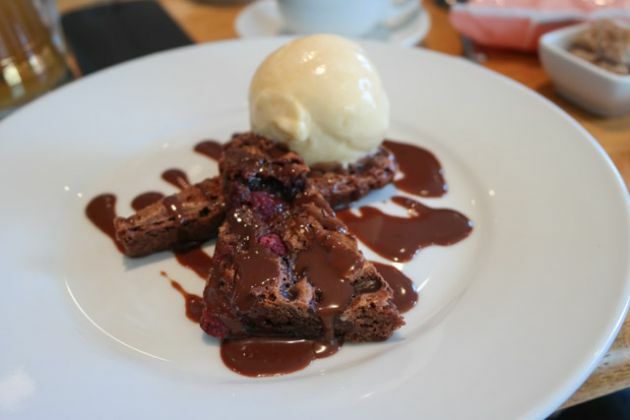 Whilst there were some nice choices for dessert, it was no contest – Raspberry Chocolate Brownie with Marzipan Ice Cream! It came out quite quickly, and it was absolutely gorgeous! The brownie was very nice and the ice cream was so creamy and with a marzipan flavour (one of the best desserts I’ve had). Just wonderful. We didn’t have a chance to use much of the children’s facilities, so unfortunately I did not find out if they have a changing area. The garden would be very good for children in the summer. JW had roast chicken for a main course, a good size and fairly reasonably priced at £6.50. The high chair was already set up and clean. Other diners were quite happy to have a baby staring at them for the whole meal, as babies do from time to time ;-) So, a place definitely suitable for a family. I wasn’t sure about booking lunch at The White Cliffs, it seemed too cheap (I am used to London prices). I needn’t have worried though, the food here was excellent. With Erdinger by the bottle available at a reasonable price, along with Kentish sparkling wine by the glass, they had the drinks covered. A venue that bakes it’s own bread shows that they care for the little touches. As regular reader know, I adore a well cooked cauliflower cheese, so the surprise of this just topped off the lunch! The service here was excellent, being friendly and helpful as well as speedy with food being served. So, I have absolutely no hesitation on awarding a Top Rated score for Sunday lunch at The White Cliffs in St Margarets, Dover! Share the love of a Sunday lunch!